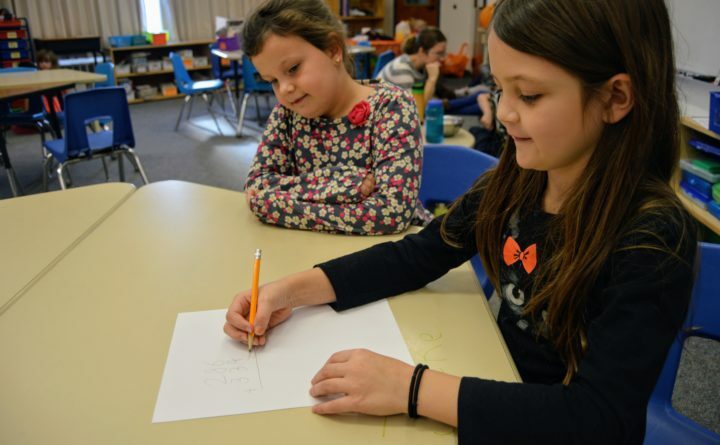 From left, Bella Koppes, 7, of Bucksport, and Aeryn Martin, 7, of Prospect, do math problems at Miles Lane School in Bucksport on Oct. 27, 2017. The school has been transitioning to a proficiency-based learning system where students must show they have learned key educational objectives to progress through their education. Parents, teachers and students packed the seats of a legislative hearing Monday to voice their opinions about two bills that would drastically change — or even repeal — Maine’s move toward proficiency-based diplomas. Six years ago, legislators passed a law saying that for students to receive a diploma in Maine, they must reach proficiency in up to eight content areas ranging from English and math to health and art. This year’s freshmen are expected to be the first to graduate with the diplomas. Over the past few months, lawmakers have heard from educators and officials concerned about the new diploma system, including that it could create a new, higher bar making it more difficult for some students — including those with disabilities — to graduate. At Monday’s hearing, stakeholders weighed in on two bills. One, from the Department of Education, would only require students meet state standards in math and English to graduate. Another would repeal the proficiency-based diploma law completely. Lawmakers heard a third bill in February to delay the diplomas for another year. Many students and teachers defended the proficiency-based model. Among them was Reese Pinkham, a middle school student who goes to school in Prospect Harbor. Researchers at the University of Southern Maine told the committee that changing the state law would only affect graduation requirements and would still allow local schools to implement proficiency-based education and grading practices inside classrooms. Others told the Education Committee that the state does need to change its diploma system. Andrew McKendry, a teacher at Forest Hills Consolidated School in Jackman — one of a few schools in the state that is set to graduate seniors with proficiency-based diplomas this year — says that while he supports many elements of proficiency-based education, requiring students to be proficient in eight subject areas is too onerous. McKendry shared the story of his daughter, who will graduate this year. He says that under his school’s proficiency-based grading system, his daughter may have ended up with a lower GPA, possibly affecting her chances at being accepted to some colleges. Lawmakers are scheduled to work on a path forward for the diplomas later this week. But they’ll need to work quickly to get a proposal to the House and Senate by April 18, when the Legislature is scheduled to adjourn.